A mobile app for iOS and Android platforms changes how you experience the museum, with alerts based on your location in the museum, audio tours, and mobile ticketing. LACMA is the largest art museum in the western United States, with a collection that includes more than 130,000 objects dating from antiquity to the present, encompassing the geographic world and nearly the entire history of art. Recognized internationally as a vital part of Southern California, LACMA shares its vast collections through exhibitions, public programs, and research facilities that attracts over million visitors annually, and millions more through its digital initiatives. How do you design an app that deliver push notifications and audio tours for a large number of activities and attractions that are constantly changing throughout the museum’s physical spaces? 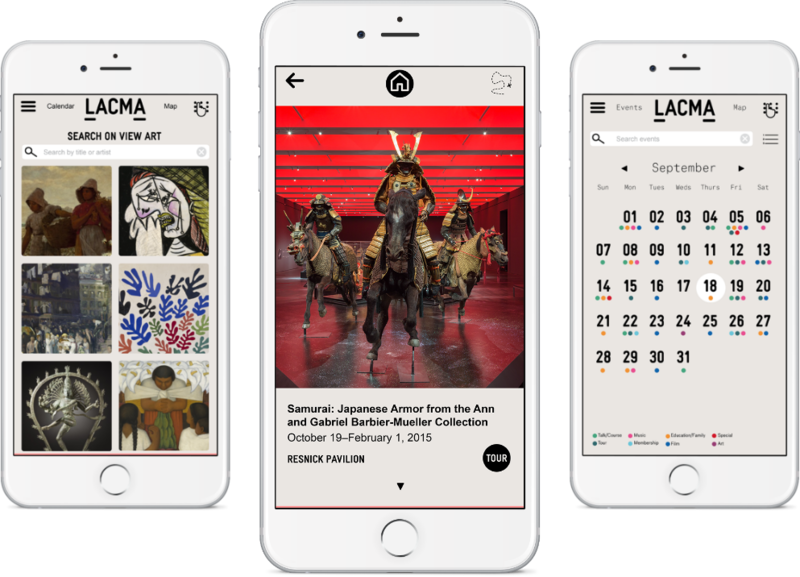 Designed for iOS and Android, the LACMA mobile app enables visitors to see everything going on at LACMA in one glance. Visitors can search the collections and find new favorites, learn more about their favorite works, and browse and search events for upcoming visits. Learn more about the LACMA App. Your own guided tour! The mobile app guides patrons through LACMA’s galleries and special exhibitions. Audio, video, and descriptions help visitors learn more about LACMA’s great works of art. Management of the system is tightly integrated with the museum’s website and event system. Urban Insight collaborated with LACMA and Qualcomm/Gimbal to integrate location-awareness technology with iOS, Android and the Drupal web content management framework. As visitors move around the LACMA campus, they are alerted to important exhibits, events, and other opportunities. "We've seen hundreds of thousands of visitors use the app to browse great works of art, find upcoming events, and learn about new exhibitions. This new version of our mobile app goes further, putting the entire collection at the fingertips of our users, wherever they may be, and using location awareness to pinpoint specific points of interest on campus."